When do colts become jacks. When Does a Jack COLT become a Jack? When does he need a stud chain? First - does this apply to showing?. If the rulebooks state an age, then any time the rules say, yes he does. 10 months, 1 year, do what the rulebooks say? This also means reading ahead for a show. If you have a yearling who has never worn a chain, get him used to it before the show. The show ring is no place to try and train an animal. Granted, there must a be a first show for everyone, and green animals are apt to do anything at all (as well as some experienced ones for that matter) but try and do as much training as possible ahead of time, at home. As for other situations, Any time over one year for certain. If you have a two-year old Mammoth jack, you have a 56" (or taller ) "monster" on your hands. Has he got raging hormones - YOU BET. He's a teenager - a teenage male at that. He doesn't have a hotrod to go cruising in, but he might rear, bray, and generally be a showoff. When should he be removed from the herd? Weaning age is most commonly 6 months. By 8 months, some jacks are becoming more aggressive in mock breeding behavior. (Jack colts, from day one, may be seen to bite, mount, and show "breeding behavior"). There have been many recorded cases of jacks siring foals when the jack colt was barely 12 months old, and several where the jack was as young as 8 months old. If you are running jennets and foals together, you run the risk of the jack foal not only breeding mature jennets, but any young jennet who comes into early heat as well. And yes, yearling jennets, even a few at 8 months, can conceive. it?s not as normal as early fertility in the male, but it has happened to enough young females to make them "Teen moms". A donkey is considered to be youngstock until age 2 - meaning 24 months. They are not physically mature at least until that age, and they certainly are not mentally mature. Just because they are having heat cycles or rutting behavior does NOT mean they are ready to have babies! How do the rules apply to jack colts and youth? What about kids and jacks in general? Most books state Youth may not show a jack. Follow the rulebooks. most classify youth as under 17 years. Your jack and child may be fine at home, but follow the rules at shows. No youth should ever handle a jack unsupervised, even at home. Keep them safe. Jacks are not pets. They are intact males that occasionally think with their hormones instead of their brains, and in that split second, someone could be hurt. Children do not have the weight to control an animal, (some adults do not either) and most do not have the experience or knowledge to handle a jack in a bad situation. If an owner asks you not to touch or come near their jack at a show - respect them - they know the animal, you do not. Same goes for at home - don't run into a pasture with a strange jack!!! In most states, equine owners are not liable for injury caused by an equine - if it is not your animal, keep your kids supervised around other people's stock. How do I show a jack with 2 handlers? Again, this is something you MUST practice at home first. You would not want to take your jack into the ring with two handlers if he has never had anyone stand and stay with him on his off side. Both handlers must be adults, the youth rule stil holds even if an adult is with the youth. Studs must be shown in stud chains, both chains must be attached to the halter. The person on the near (left shoulder) side is primary. The person on the off side is there for control. The near-side handler should be in charge. Both people have to work as a team, and the jack must be comfortable with both of them there. If he lugs to the right, don't put a small person there who cannot shove him back into line. But don't be lulled into a sense of false security with two handlers on a jack. Most don't really need it. A few do better with two people to calm and stabilize him. But a few will take two, three, or even five handlers wherever he wants if he decides he is leaving the area, ring or building. We've seen a large standard jack drag 5 grown men - three of whom had a lead rope, neck rope, or stud chain on the head, two draped over his neck and back - for more than 100 yards before they got a rope wrapped around a stout post. My jack has never worn a studchain and won't behave when I tried one. How can I show him if he has to have a chain? Try a bit and bridle instead of the chain. Most rulebooks stipulate a jack must be shown with a stud chain over or under the jaw, or through the mouth, or with a stallion bridle and bit. Mammoth Jacks are frequently shown in headstalls with snaffle bits - this might be an option for your colt. What age should my jack start breeding? Physically, some jacks can sire offspring by the age of 8 months. We have heard of colts as young as 6 months. This is a good incentive for making sure your colts are weaned an separated at about 8 months. However, your jack colt needs time to be that teenager, to hang out with the guys and just be a kid. His serious breeding career, if he is to be a herdsire, should not start until he is 2. He will sire many foals for many years to come. Let him mature, go to some shows, earn a name for himself and learn manners, then sire foals that will be as nice as he is! 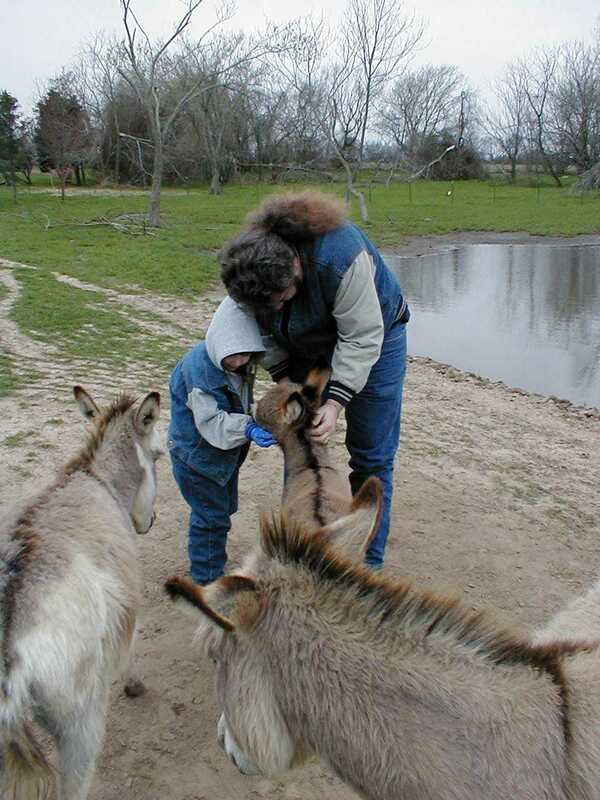 Miniature donkey jack foal "Rowdy Rosecroix"and other miniature donkeys. Jack colts, no matter their size or age, are often pushy and will charge right up to visitors. This isn't necesaarily bad, but it might need to be midified before they become accustomed to being bossy.